Sunlight (UVB) triggers cutaneous lupus erythematosus (CLE) and systemic lupus through an unknown mechanism. We tested the hypothesis that UVB triggers CLE through a CSF-1-dependent, macrophage (Mø)-mediated mechanism in MRL-Faslpr mice. By constructing mutant MRL-Faslpr strains expressing varying levels of CSF-1 (high, intermediate, none), and use of an ex vivo gene transfer to deliver CSF-1 intradermally, we determined that CSF-1 induces CLE in lupus-susceptible MRL-Faslpr mice, but not in lupus-resistant BALB/c mice. UVB incites an increase in Møs, apoptosis in the skin, and CLE in MRL-Faslpr, but not in CSF-1-deficient MRL-Faslpr mice. Furthermore, UVB did not induce CLE in BALB/c mice. Probing further, UVB stimulates CSF-1 expression by keratinocytes leading to recruitment and activation of Møs that, in turn, release mediators, which induce apoptosis in keratinocytes. Thus, sunlight triggers a CSF-1-dependent, Mø-mediated destructive inflammation in the skin leading to CLE in lupus-susceptible MRL-Faslpr but not lupus-resistant BALB/c mice. Taken together, CSF-1 is envisioned as the match and lupus susceptibility as the tinder leading to CLE. Cutaneous involvement, cutaneous lupus erythematosus (CLE), 3 is common in patients with lupus and is often the first manifestation (1). Sunlight exposure (UVB) to the skin triggers CLE and systemic lupus (1). Despite the pivotal position of the skin in lupus, the pathogenesis of CLE and the mechanisms responsible for UVB-incited CLE are poorly understood. Progress in pinpointing the precise mechanisms responsible for CLE and the role of UVB has been hindered by lack of a well-studied animal model that shares features with the human illness. Although several mouse models for lupus nephritis are available, MRL-Faslpr is the only strain that develops a reliable multiorgan lupus that is similar to human lupus including skin, lung, salivary/lacrimal gland pathology, and arthritis (2). These mice may prove valuable for dissecting the pathogenesis of CLE for several reasons. Similar to human CLE, skin lesions in MRL-Faslpr mice are common (80% incidence) and involve a chronic inflammatory process that is leukocyte dependent (3, 4, 5, 6). Furthermore, because CLE in MRL-Faslpr mice is evident early in life (3 mo of age), and the incidence and severity progressively increase until death (5–6 mo of age, 50% mortality), the tempo is conducive for dissecting the pathogenesis of CLE. By comparison, MRL mice that do not have a mutation in Fas (MRL/MpJ-+/+; MRL-++) develop a far more indolent and milder cutaneous disease (7). As lupus susceptibility is related to MRL background genes, MRL mice may provide a means to decipher molecular pathways driving the development of CLE. Despite the overwhelming evidence supporting a role for T lymphocytes in CLE, innate immunity and inflammation are central to the pathogenesis of autoimmune skin disease (8, 9). The skin, the first line of defense from the environment, is rich in sentinel cells, such as macrophages (Mø), dendritic cells (DC), and Langerhans cells, key leukocytes in innate immunity and inflammation (10). Møs and DCs are the primary leukocytes in the dermis of a healthy mouse, with Møs far outnumbering DCs, at a ratio of 6:1 (11). Moreover, larger numbers of Mø traffic to the dermis during inflammation (12, 13, 14, 15). On activation, Møs release mediators that induce apoptosis of parenchymal cells and therefore are central to tissue injury (16). Thus, we hypothesize that Møs are pivotal in CLE in MRL-Faslpr mice. The major regulator of Mø development is CSF-1 (17). CSF-1 binds to a single receptor, encoded by the proto-oncogene c-fms, which is expressed on skin Møs, DCs, and Langerhans cells that are derived from monocytes (18, 19). Although the contribution of Møs and CSF-1 to CLE has not been explored, we have identified multiple links between CSF-1, Møs, and inflammation in the development of systemic lupus in MRL-Faslpr mice: 1) CSF-1 expression increases in the serum and kidney before nephritis and rises with advancing disease (20); 2) Møs and T cells localize within intrarenal sites rich in CSF-1 (21); 3) systemic disease (kidney, salivary/lacrimal gland and lung pathology) is suppressed and skin lesions are not visible in CSF-1-deficient (Csf1op/op) MRL-Faslpr (Csf1op/op;MRL-Faslpr) mice (22); and 4) CSF-1 mediates Mø recruitment, activation, and in turn, Mø-dependent tubular epithelial cell (TEC) apoptosis during nephritis (23). Thus, we singled out CSF-1R-bearing Møs for further study. Given the importance of sunlight in triggering CLE in human lupus and the central role of Møs in host defense from environmental stimuli, we tested the hypothesis that sunlight triggers CLE through the induction of a CSF-1-dependent, Mø-mediated mechanism in MRL-Faslpr mice. Mice heterozygous for the osteopetrotic mutation (Csf1op) on the C57BL/6J × C3Heb/FeJ-a/a background, BALB/c, C57BL/6 (B6), MRL-++, and MRL/MpJ-Faslpr/Faslpr (MRL-Faslpr) mice were purchased from The Jackson Laboratory. The Csf1op mutation was backcrossed onto the MRL-Faslpr background for 10 generations. Transgenic mice (C57BL/6 × CBAF1) expressing enhanced GFP (EGFP) under the control of the CSF-1R (c-fms) promoter and first intron (Tgfms-EGFP), referred to as MacGreen mice (24), were provided by Dr. D. A. Hume (University of Queensland, Brisbane, Australia), and this transgene, together with the TgN(FLCsf1)Ers (TgC) transgene (expressing the full-length CSF-1 gene driven by the CSF-1 promoter/first intron) from TgN(FLCsf1)9Ers/+ mice (25), were backcrossed onto the MRL-Faslpr background for seven generations and were referred to as MacGreen;MRL-Faslpr and TgC/+;MRL-Faslpr, respectively. Mice were bred and housed at Harvard Medical School (Boston, MA). Only female mice were used. The use of mice in this study was reviewed and approved by the Standing Committee on Animals in the Harvard Medical School in adherence to the National Institutes of Health Guide for the Care and Use of Laboratory Animals. To quantify the levels of CSF-1 in serum, supernatants, and tissue homogenates, we evaluated samples using a previously published ELISA method (26). Briefly, we homogenized tissue samples using a MixMill 300 (Qiagen). We determined the protein concentration of each homogenate using the bicinchoninic acid protein assay kit (Pierce) and evaluated 200 μg of protein per tissue sample. We did not dilute the serum and supernatants. The Abs and reagents in this assay were purchased from BD Biosciences. To determine the level of anti-SSA (Ro) and anti-SSB (La) Abs in the circulation, we used the ELISA kit (AESKULISA ANA-8Pro; AESKU. Diagnostics) and anti-mouse IgG (Sigma-Aldrich) according to the manufacturer’s instructions. We scored the severity of visible skin lesions as follows: 0, none; 1, mild (snout and ears); 2, moderate, <2 cm (snout, ears, intrascapular); 3, severe, >2 cm (snout, ears, intrascapular). We fixed sections of the skin (5 by 15 mm) in 10% neutral buffered formalin for 24 h and stained paraffin sections with H&E as described previously (27). We assessed skin sections using the following categories: 0, normal unaffected skin; 1 (mild), few focal dermal infiltrates (superficial and/or deep), normal thickness of epidermis (3- to 5-cell layer); 2 (intermediate), disseminated dermal infiltrates (superficial and/or deep), increased epidermal thickness (acanthosis, >5 cell layer) and hypergranulosis/hyperkeratosis, interface vacuolar changes with or without rare apoptotic keratinocytes (Civatte bodies); and 3 (advanced), disseminated dermal infiltrates (superficial and deep), increased epidermal thickness (acanthosis, >10-cell layer) with hypergranulosis/hyperkeratosis and follicular plugging, interface vacuolar changes with scattered apoptotic keratinocytes (Civatte bodies) with/without basement membrane thickening, and scarring alopecia. Histopathology was graded using coded slides. We fixed cryostat sectioned frozen tissue in 100% acetone, followed by incubation with fluorescein-conjugated Abs specific for mouse IgG, IgG1, IgM, or C3 (ICN Biomedicals) for 30 min. Igs/C3 were detected using Nikon Eclipse E1000 upright fluorescence microscope. We stained frozen skin sections for the presence of Møs, T cells, and apoptotic cells (cleaved caspase-3-positive cells) using anti-CD68 Ab (Serotec), anti-CD4 Ab, anti-CD8 Ab (eBioscience), and anti-cleaved caspase-3 Ab (Asp175; Cell-signaling), as previously described (28). The number of cells bearing CD4, CD8, and CD68 determinants and apoptotic cells was assessed in 10 randomly selected high-power fields. To determine the number of CD68+CD11c− and CD68+CD11c+ cells in the skin, we fixed and incubated frozen skin sections with purified rat anti-CD68 Ab (Serotec), biotinylated rabbit anti-rat Ab, streptavidin Texas Red (Vector), and CD11c-FITC Ab (eBioscience). The mouse keratinocyte line, PAM212 (provided by Dr. J. G. Rheinwald, Brigham and Women’s Hospital, Boston, MA), was cultured as previously described (29). We isolated keratinocytes and dermal fibroblasts from mouse ears (30, 31). Briefly, we divided ears into dorsal and ventral halves, treated them with 1% trypsin (Invitrogen), and then separated epidermis and dermis. To isolate keratinocytes, we filtered (100-μm pore size) epidermal cells, then seeded the cell suspension onto collagen type I (BD Biosciences) coated plates in keratinocyte SFM-Media (Invitrogen). To isolate dermal fibroblasts, we minced and digested the dermis with collagenase (Sigma-Aldrich). The remaining undigested tissue was filtered (100-μm pore size). We cultured these cells in complete DMEM (Invitrogen) containing 10% FCS (Atlanta Biologicals). We isolated and cultured primary dermal fibroblasts (see above) and renal TECs derived from MRL-Faslpr, CSF-1op/op;MRL-Faslpr, and BALB/c mice, as previously described (32). CRIP packaging cell lines producing helper-free recombinant retroviruses carrying the CSF-1 gene were generated (33). Briefly, DNA sequences encoding CSF-1 (bp 160-1874; provided by Dr. R. C. Mulligan, Department of Genetics, Children’s Hospital, Boston, MA) were subcloned into the Moloney murine leukemia virus-based MFG vector. The MFG vector carrying the CSF-1 gene was introduced into a mammalian packaging cell line (CRIP). Using the virus-containing cell culture supernatants, we infected primary cultured TECs and dermal fibroblasts, referred to as CSF-1 carrier cells. For controls, TECs or dermal fibroblasts were infected with the supernatant of CRIP cells transfected with the MFG vector alone, referred to as empty vector carrier cells. We verified successful transfection of TECs and dermal fibroblasts by quantifying CSF-1 in the supernatant. To deliver CSF-1 into the skin, we infused CSF-1 carrier cells or empty vector carrier cells (5 × 106) in HBSS (100 μl), into the intrascapular area intradermally. The cell viability (>90%) was determined (trypan blue exclusion) immediately before infusion of these carrier cells. We excised and snap froze skin containing the area that was infused at days 3 and 28 postinfusion. We compared the maximal lesions in each mouse, selected by evaluating serial sections (4 μm) every 20 μm. To expose the skin (2 mo of age) to UVB, we anesthetized mice and removed the hair on their backs with a shaver. We irradiated these mice with a set of four FS-20 UVB lamps (National Biological, Westinghouse), filtered by a Kodacel membrane to eliminate residual UVC. The energy output of the UVB lamps was measured with an UV radiometer at a distance of 17 cm. Mice were exposed daily to 500 J/m2. The PAM 212 cell line and primary cultured mouse keratinocytes and dermal fibroblasts were grown until confluent and then exposed to UVB (500J/m2) either once or twice (24 h apart). CSF-1 levels in the supernatant were analyzed (ELISA) 24 h after the last dose of UVB. We isolated bone marrow (BM) from MacGreen; MRL-Faslpr mice (34) and injected these cells (2 × 107) i.v. into the tail. We sacrificed these mice 48 h later and prepared skin (ear) and blood samples to detect the adoptively transferred EGFP+ cells using flow cytometry as previously described (35). We isolated BMMøs as previously described (34). When the cultured cells were confluent, we stimulated them with CSF-1 (10 ng/ml; Preprotech), LPS (5 μg/ml) (Sigma-Aldrich), and IFN-γ (500 U/ml; Sigma-Aldrich). We collected supernatant from unstimulated and stimulated BMMø (CSF-1 or LPS/IFN-γ for 24 h). These supernatants were added to cultured mouse keratinocytes or dermal fibroblasts (cell line, PAM212). After 48 h, we assessed early (annexin) and late (annexin- propidium iodide; PI) apoptosis by flow cytometry using the annexin V-FITC- propidium iodide kit (BD Biosciences) according to the manufacturer’s instructions (36). We prepared and stained single-cell suspensions from skin as previously described (35). We used the following Abs for FACS analysis: PE-conjugated anti-CD86; PE-Cy5 conjugated anti-CD8 (53-6.7); anti-CD11c (N418); and allophycocyanin-conjugated anti-CD45.1 (A20), anti-CD4 (RM4-5), and anti-F4/80 (BM8) from eBioscience. We used FITC-conjugated CD11b (M1/70) from BD Pharmingen and FITC- and allophycocyanin-conjugated anti-CD68 (FA11) from Serotec. We collected 0.25–0.5 × 106 skin cells using a FACSCalibur (BD Bioscience) and analyzed data using FlowJo software (Tree Star). Data represent the mean ± SEM and were prepared using GraphPad PRISM version 4.0. We used the nonparametric Mann-Whitney U test and the one-way ANOVA test to evaluate p values. Cutaneous lesions in MRL-Faslpr mice, identifiable within the intrascapular area, on the ears, and face (snout), develop in the majority of MRL-Faslpr mice. Moreover, cutaneous lesions in MRL-Faslpr mice, presenting as erythematous follicular plaques with/without ulceration and scarring alopecia, share features with human lupus (Fig. 1⇓A; Refs. 2 and 5). Histopathologically, these cutaneous lesions are similar to the verrucoid variant of human discoid lupus (Fig. 1⇓A). Cutaneous lesions in MRL-Faslpr mice consist of superficial and deep perivascular and periadnexal infiltrates with associated interface vacuolar degeneration of basal keratinocytes, apoptotic keratinocytes, papillomatosis, and hyperkeratosis with follicular plugging, and scarring alopecia. A lupus band (detecting deposits of immune complexes at the dermal-epidermal junction), pathognomic for human CLE (37), is detected in skin with and without CLE lesions (Fig. 1⇓B). In accordance with the photosensitivity in human lupus, UVB irradiation of MRL-Faslpr mice, but not of lupus-resistant BALB/c mice (data not shown), induces a lupus band in advance of CLE (Fig. 1⇓C). In another striking parallel to human CLE, Ro, and La autoantibodies are detected at 6 mo of age in MRL-Faslpr mice with CLE (Ro 3.17 ± 0.34; La 3.17 ± 0.41; n = 6), but not at 2 mo of age in MRL-Faslpr mice before CLE (Ro 0.20 ± 0.06; La 0.15 ± 0.06; n = 6; p < 0.01), or in lupus-resistant control BALB/c mice (Ro 0.05 ± 0.01; La 0.04 ± 0.01; n = 6; p < 0.01). Taken together, the cutaneous pathology, photosensitivity, and accompanying formation of lupus bands and distinctive autoAbs in MRL-Faslpr mice closely resemble manifestations of human CLE. Cutaneous lesions in MRL-Faslpr mice share features with human discoid CLE. A, Gross cutaneous lesions in the intrascapular area and ears in MRL-Faslpr mice. Histopathologically cutaneous lesions in MRL-Faslpr mice resemble the verrucoid variant of discoid lupus characterized by interface vacuolar changes (black arrowheads) with apoptotic keratinocytes (white open arrow), acanthotic epidermis (double-headed arrow) with hyperkeratosis (V), hypergranulosis (#), and follicular plugging (*), superficial and deep, as well as perifollicular inflammatory infiltrates (arrows) and associated scarring alopecia with markedly reduced hair follicles (H) and dermal fibrosis (@). Representative photomicrographs from MRL-Faslpr mice (5 mo of age), H&E-stained sections (n = 18). ×20; inset, ×40. Inset in right panel, apoptotic keratinocytes, ×60. B, Positive lupus band (IgG and C3 deposits) at the dermal-epidermal junction in lesional and nonlesional skin of MRL-Faslpr mice (3 mo of age) determined by immunofluorescence staining. Representative of n = 5–7. The pattern of IgM and IgG1 staining at the dermal-epidermal junction (data not shown) was more focal than IgG and C3. We did not detect a lupus band in BALB/c skin (data not shown). *, dermal-epidermal junction; ·····, border of the epidermis to the environment. C, MRL-Faslpr skin is photosensitive. UVB irradiation (6 consecutive days, 500 J/m2) induces the lupus band (IgG, C3) as well as IgM and IgG1 (data not shown) at the dermal-epidermal junctions in MRL-Faslpr mice (2 mo of age), but not in BALB/c mice (data not shown). Representative of n = 4–6; experiment repeated twice. To test the hypothesis that robust expression of CSF-1 exacerbates CLE, we analyzed MRL-Faslpr CSF-1-transgenic mice. We have previously reported that CSF-1-deficient MRL-Faslpr (Csf1op/op;MRL-Faslpr) mice do not develop visible skin lesions, and systemic pathology characteristic of this strain (23). To verify that the CSF-1 promoter/first intron-driven full-length CSF-1 transgene (25) used to overexpress CSF-1 restored disease-related tissue expression of CSF-1, we created TgC/+;Csf1op/op;MRL-Faslpr mice, in which the only source of CSF-1 was encoded by the TgC transgene and compared circulating and tissue CSF-1 production and CLE development in this transgenic mouse with MRL-Faslpr mice. In the TgC/+;Csf1op/op;MRL-Faslpr mouse, CSF-1 expression in the serum, skin, and other tissues (kidney, salivary gland, lung, spleen, and lymph nodes) as well as cutaneous, and the systemic pathology (kidney, lung, spleen, and lymph nodes), were restored to the values in age-matched MRL-Faslpr mice (data not shown). CSF-1-deficient MRL-Faslpr mice were used as negative controls. Thus, the TgC transgene drives disease-related tissue expression of CSF-1 in MRL-Faslpr mice. To overexpress CSF-1 in MRL-Faslpr mice, we constructed TgC/+;MRL-Faslpr mice in which CSF-1 is expressed from both the wild-type CSF-1 gene and the TgC transgene. To determine whether this strategy amplified CSF-1 expression, we compared CSF-1 levels in the serum and skin of TgC/+;MRL-Faslpr and MRL-Faslpr mice, using CSF-1-deficient MRL-Faslpr mice as a negative control. CSF-1 expression in MRL-Faslpr mice progressively rose as disease advanced (1.5, 3.0 and 5.0 mo of age; Fig. 2⇓, A and B). However, the increase in CSF-1 in the TgC/+;MRL-Faslpr was, as expected, greater than in MRL-Faslpr mice. By comparison, serum CSF-1 levels in age-matched MRL-++ and B6, lupus-resistant mice remained unchanged. Thus, we have constructed mutant MRL-Faslpr strains that allow analysis of disease expression in mice with varying levels of CSF-1 in serum and skin: TgC/+;MRL-Faslpr (high), MRL-Faslpr (intermediate), and Csf1op/op;MRL-Faslpr (none). Increasing CSF-1 expression in MRL-Faslpr mice accelerates the tempo of CLE. A, Serum CSF-1 levels in TgC/+;MRL-Faslpr, MRL-Faslpr, and Csf1op/op;MRL-Faslpr mice at 1.5, 3.0, and 5.0 mo of age. B, Skin CSF-1 levels in homogenates determined by ELISA. C, Time-related incidence and severity of skin lesions in TgC/+;MRL-Faslpr, MRL-Faslpr, and Csf1op/op;MRL-Faslpr mice from 2 to 6 mo of age. Values are mean ± SEM. Representative photomicrographs from MRL-Faslpr at 3 mo of age. D, Skin (intrascapular) histopathology comparing TgC/+;MRL-Faslpr, MRL-Faslpr, and Csf1op/op;MRL-Faslpr mice. MRL-++ and B6 mice with normal skin are controls. The cutaneous lesions in TgC/+;MRL-Faslpr mice include: interface vacuolar changes (black arrowheads), acanthotic epidermis (double arrow) with hyperkeratosis (V), hypergranulosis (#), and follicular plugging (*), superficial and deep, as well as perifollicular inflammatory infiltrates (arrows) and dermal scarring (@). Representative skin H&E-stained sections (3 mo of age). ×20; inset, ×40. To determine whether an increase in CSF-1 influences the course of CLE, we compared the skin lesion in TgC/+;MRL-Faslpr, MRL-Faslpr and Csf1op/op;MRL-Faslpr mice. 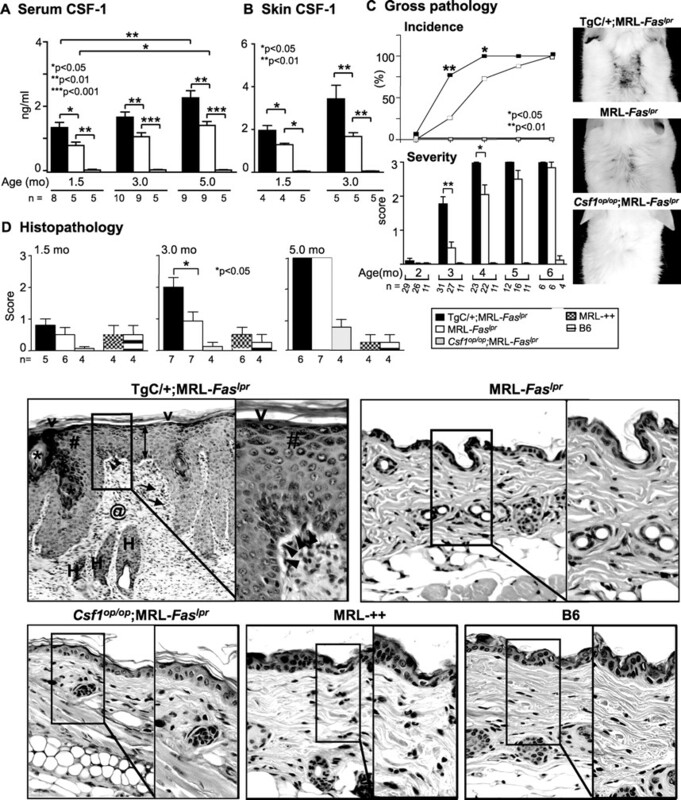 The development of gross and histopathological skin lesions in TgC/+;MRL-Faslpr mice that have amplified CSF-1 expression increased more rapidly than in MRL-Faslpr mice (Fig. 2⇑C). The gross cutaneous pathology peaked in the TgC/+;MRL-Faslpr mice at 4 mo of age as compared with 6 mo of age in MRL-Faslpr mice. Furthermore, cutaneous histopathology was substantially greater in TgC/+;MRL-Faslpr than in the MRL-Faslpr strain at 3 mo of age (Fig. 2⇑D). MRL-++ and B6 skin remained normal between 1.5 and 5.0 mo of age. Thus, the tempo of cutaneous pathology is accelerated by up-regulating CSF-1 in MRL-Faslpr mice. We detected a robust increase in CSF-1R-bearing Møs and dermal DCs (expressing CD68) in the TgC/+;MRL-Faslpr as compared with MRL-Faslpr skin (Fig. 3⇓A). The proportion of CD68+ leukocytes in the skin that are Møs (∼90%, F4/80+, CD68+CD11c−) grossly exceeds that of DCs (∼10%, CD68+CD11c+) as determined by flow cytometry and immunofluorescence (Fig. 3⇓B). Infiltrating CD68+ leukocytes were more abundant than CD4+ T cells at all time points (Fig. 3⇓A), whereas few CD8+ leukocytes were detected in the TgC/+;MRL-Faslpr or MRL-Faslpr mice. In contrast, leukocytes in the skin were much less abundant in mice without CLE (Csf1op/op;MRL-Faslpr, MRL-++, and B6 mice; Fig. 3⇓). 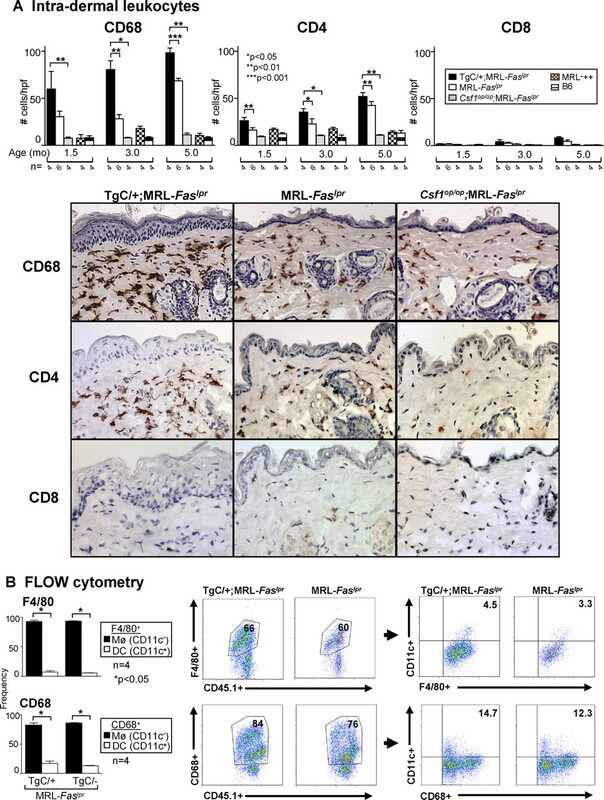 Taken together, an increase in CSF-1 in the skin is associated with a rise in the infiltration of CD68+, most notably Møs, and CD4+ leukocytes in the skin and CLE expression in MRL-Faslpr mice. Intradermal leukocytes (CD68, CD4) increase in TgC/+;MRL-Faslpr mice compared with MRL-Faslpr mice. A, We evaluated the number of intradermal CD68+ cells (Møs, DCs) and T cells (CD4+ and CD8+) from TgC/+;MRL-Faslpr, MRL-Faslpr, Csf1op/op;MRL-Faslpr mice, MRL-++ and B6 mice at 1.5, 3.0, and 5.0 mo of age. Representative photomicrographs are from mice at 3 mo of age. In addition, intraepidermal leukocytes (CD68+ and CD4+) were increased (n = 4–7, data not shown). B, Intradermal CD68+ leukocytes in MRL-Faslpr mice are predominantly Møs. Flow cytometric analysis of intradermal Møs (F4/80+CD11c− and CD68+CD11c−) and DCs (F4/80+CD11c+ and CD68+CD11c+) in TgC/+;MRL-Faslpr compared with MRL-Faslpr mice. Graphs depict the average frequency of CD11c− and CD11c+ cells in the CD45.1+F4/80+ and CD68+ populations. Values are mean ± SEM. To test the hypothesis that expression of CSF-1 in the skin incites CLE, we injected syngeneic dermal fibroblasts genetically modified to constitutively express CSF-1 (CSF-1 carrier cells) into the skin of lupus-susceptible, MRL-Faslpr mice before the advent of cutaneous lesions (2 mo of age), and lupus-resistant BALB/c mice (age-matched). MRL-Faslpr and BALB/c CSF-1 carrier cells generated similar levels of CSF-1 in vitro, and these levels were substantially higher (∼2×) than dermal fibroblasts transfected with an empty vector (empty vector carrier cells) (Fig. 4⇓A1). Infusing syngeneic CSF-1 carrier cells, but not empty vector carrier cells, into the skin similarly increased intradermal CSF-1 (area adjacent to infusion site) that spills over into the serum in MRL-Faslpr and BALB/c mice (3 days postinfusion, Fig. 4⇓A2). The increase in intradermal CSF-1 using CSF-1 carrier cells, but not the empty vector carrier cells, incited CLE in MRL-Faslpr mice, but not in BALB/c mice, in the area adjacent (Fig. 4⇓B), but not distal (data not shown) to the infusion site. Intradermal CSF-1 expression resulted in the infiltration of far more CD68+ (mainly Møs, F4/80+CD11b+CD11c−; data not shown) and CD4+ with few CD8+ leukocytes in the MRL-Faslpr skin than in BALB/c mice, a pattern similar to the spontaneous CLE (Fig. 4⇓C). To eliminate the possibility that dermal fibroblasts uniquely contributed to these lesions, we repeated these studies using TECs instead of dermal fibroblasts. The results were similar (data not shown). Taken together, an intradermal increase in CSF-1 fosters the accumulation of mainly Møs and incites CLE in lupus-susceptible, but not in lupus-resistant mice. Increasing intradermal CSF-1 incites CLE in MRL-Faslpr mice. A1, We verified that dermal fibroblasts from MRL-Faslpr and BALB/c mice genetically modified with a retroviral vector encoding CSF-1 constitutively express similar levels of CSF-1 (CSF-1 carrier cells); empty vector carrier cells serve as controls. A2, CSF-1 was measured in the skin (area adjacent to infusion site) and serum of MRL-Faslpr and BALB/c mice following intradermal delivery of carrier cells at 3 days postinfusion. B, CLE is incited in the area of infusion and adjacent to infusion site 28 days postinfusion in MRL-Faslpr, but not BALB/c mice infused intradermally with CSF-1 carrier cells and characterized by interface vacuolar changes (black arrowheads) with hypergranulosis (#), and superficial, deep and perifollicular inflammatory infiltrates (arrows) with scarring alopecia (@). Representative photomicrographs. ×20; inset, ×40. C, Leukocyte-rich CLE incited by “CSF-1 carrier cells in MRL-Faslpr, but not BALB/c mice. We evaluated intradermal Møs/DCs (CD68+) and CD4+ and CD8+ T cells in the area adjacent to the carrier cell infusion. Data are representative of two separate experiments using dermal fibroblasts and TEC carrier cells and an additional experiment infusing more (1.0 × 107) carrier cells. Values are mean ± SEM. Sunlight triggers CLE in humans (1). 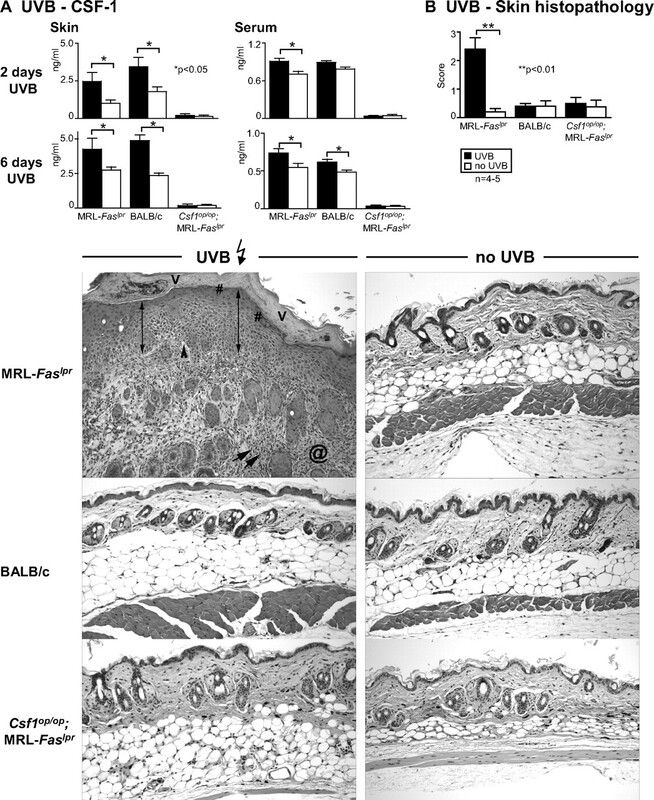 Does UVB induce CSF-1 expression in the skin and CLE in MRL-Faslpr mice? After UVB exposure for 2 consecutive days, we detected a substantial rise in CSF-1 expression in skin and serum in MRL-Faslpr and BALB/c mice (Fig. 5⇓A). The CSF-1 level in the skin and serum in both strains remained similarly elevated after 6 consecutive days of UVB (Fig. 5⇓A). At this point, MRL-Faslpr mice, but not BALB/c mice, developed gross skin lesions (data not shown) with histopathological features of CLE (Fig. 5⇓B). MRL-Faslpr and BALB/c are albino mice. UVB exposure to other lupus-resistant albino strains including MRL-++ (Fas intact that do not develop skin lesions until the second year of life; see Ref. 38), BALB/c-gld (mutation in Fas ligand), and NOD mice (autoimmune diabetes) does not incite CLE (data not shown). Moreover, UVB did not incite CLE in Csf1op/op;MRL-Faslpr mice (Fig. 5⇓B), indicating that expression of CLE requires CSF-1. Although infiltration of CD68+ leukocytes increased in the epidermis and dermis in MRL-Faslpr and BALB/c mice following UVB exposure (2 and 6 days) as compared with sham-treated controls, far more CD68+ leukocytes (∼2×) accumulated in MRL-Faslpr than in BALB/c mice (Fig. 6⇓, top). The majority of CD68+ leukocytes were Møs (CD68+CD11c−) rather than DCs (CD68+CD11c+; ∼5:1 ratio). The proportion of intradermal CD68+ leukocytes that are Møs in comparison with DCs did not change in MRL-Faslpr (UVB 79.88 ± 1.40; 15.02 ± 0.80 vs no UVB 78.47 ± 1.08; 16.87 ± 1.52) and BALB/c (UVB 80.05 ± 0.39; 14.71 ± 0.79 vs no UVB 73.50 ± 3.04; 15.23 ± 0.47) mice following UVB determined by flow cytometry. we detected few CD68+ leukocytes in Csf1op/op;MRL-Faslpr skin, and this number did not rise following UVB exposure (Fig. 6⇓, top). Moreover, whereas intradermal CD4+ T cells increase in response to UVB, CD68+ leukocytes are more abundant. The initial response to UVB (2 days) resulted in a rise in Møs and not T cells in the epidermis (Fig. 6⇓, bottom), suggesting that the initial impact on the epidermis is Mø dependent. Taken together, UVB induces CSF-1-dependent CLE in lupus-susceptible MRL-Faslpr, but not in lupus-resistant BALB/c mice. UVB irradiation increases CSF-1 expression and incites CLE in MRL-Faslp mice. A, We irradiated MRL-Faslpr, Csf1op/op;MRL-Faslpr, and BALB/c mice daily (500 J/m2 UVB) until we detected visible lesions (6 days). CSF-1 levels were measured (ELISA) in the skin and serum of MRL-Faslpr and BALB/c mice after 2 and 6 days of UVB irradiation. UVB-irradiated Csf1op/op;MRL-Faslpr mice served as negative controls. Values are mean ± SEM. B, Histopathologically, UVB incited CLE in MRL-Faslpr, but not BALB/c mice. The UVB-incited features of CLE consisted of vacuolar interface changes (black arrowheads), apoptotic keratinocytes, acanthotic epidermis (double arrow) with hyperkeratosis (V), hypergranulosis (#), and superficial and deep, as well as perifollicular inflammatory infiltrates (arrows) with dermal fibrosis (@). UVB-irradiated Csf1op/op;MRL-Faslpr mice did not develop CLE. Representative photomicrographs. ×20. Data are representative of two separate experiments. More CD68+ leukocytes are in the skin of MRL-Faslpr, Csf1op/op;MRL-Faslpr and BALB/c following UVB exposure. MRL-Faslpr, Csf1op/op;MRL-Faslpr and BALB/c mice (2 mo of age) exposed to UVB for 2 and 6 days. We analyzed the epidermis and dermis for CD68+ leukocytes and CD4+ T cells. Values are mean ± SEM. To determine the mechanism responsible for UVB-incited CSF-1-dependent CLE, we tested the hypothesis that CSF-1 expression in the skin recruits Møs from the circulation. For this purpose, we utilized BM cells from MacGreen;MRL-Faslpr mice that express EGFP under control of the c-fms promoter and in which CSF-1R+ leukocytes are readily detected in the blood (96% of CD11b+ leukocytes are EGFP+) and skin (45% of CD45.1+ leukocytes are EGFP+; Fig. 7⇓A). We adoptively transferred BM cells from MacGreen;MRL-Faslpr mice into MRL-Faslpr mice with varying levels of CSF-1 (TgC/+;MRL-Faslpr > MRL-Faslpr > Csf1op/op;MRL-Faslpr). First, we verified that equivalent numbers of EGFP+ cells were delivered into the blood (Fig. 7⇓A). The number of EGFP+ Møs recruited into the skin paralleled the level of CSF-1 levels in the skin (TgC/+;MRL-Faslpr > MRL-Faslpr > Csf1op/op;MRL-Faslpr; Fig. 7⇓A). Thus, CSF-1 recruits c-fms+ BM-derived monocytes into the skin in MRL-Faslpr mice. CSF-1, generated by keratinocytes/dermal fibroblasts, recruits and activates Møs in the skin, which in turn, induces apoptosis in keratinocytes. A, CSF-1 recruits EGFP+ BM cells into the skin. We transferred BM cells from MacGreen (EGFP+);MRL-Faslpr mice into TgC/+;MRL-Faslpr, MRL-Faslpr, and Csf1op/op;MRL-Faslpr mice and evaluated the recruitment of EGFP+ cells into the skin (flow cytometry). Data are representative of three separate experiments. B, UVB-induced apoptosis in epidermis and dermis is far more robust in MRL-Faslpr mice than in Csf1op/op;MRL-Faslpr and BALB/c mice. We evaluated the epidermis and dermis for apoptotic (cleaved caspase-3+) cells following UVB-exposure (6 days). Sham-treated mice served as controls. Values are mean ± SEM. C, CSF-1 is up-regulated in mouse primary keratinocytes and dermal fibroblast (derived from MRL-Faslpr mice) irradiated with UVB once with a dose of 500 J/m2 in vitro. CSF-1 levels in the supernatant were analyzed 24 h after UVB exposure (ELISA). Keratinocytes and dermal fibroblasts isolated from Csf1op/op;MRL-Faslpr mice served as negative controls. Data are representative of two separate experiments. D, Møs release mediators that induce apoptosis in keratinocytes. Supernatants from BMMøs stimulated with CSF-1 (100 ng/ml) released mediators that induced apoptosis in keratinocytes that was more robust than the apoptosis induced by supernatants from unstimulated BMMøs (annexin V-FITC and PI using flow cytometry). Data are representative of three experiments. Values are mean ± SEM. In lupus nephritis, activated Møs accumulate adjacent to cells (TECs) rich in CSF-1 and release mediators that induce TEC apoptosis (16). Thus, we hypothesized that CSF-1 attracted and activated Møs that induce apoptosis of skin parenchymal cells. 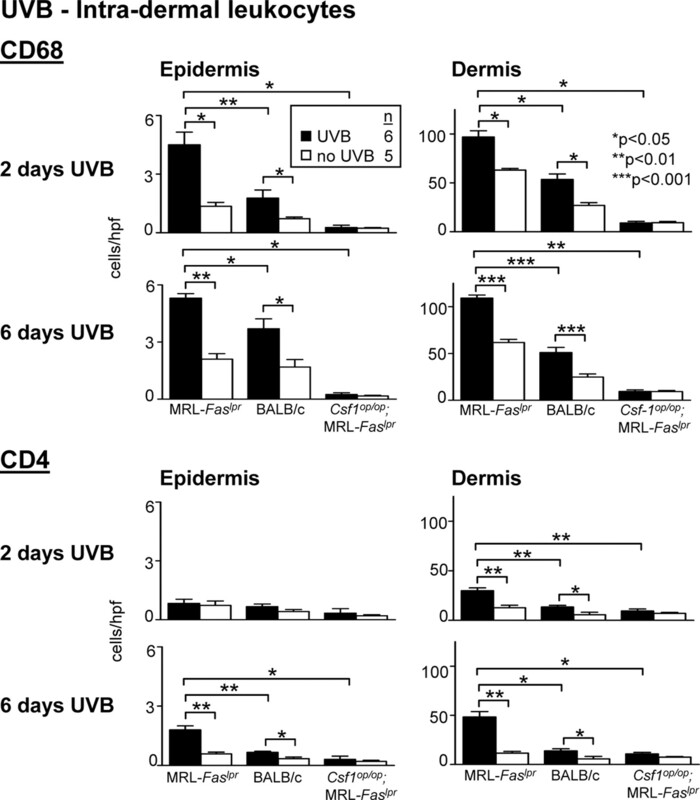 After UVB irradiation (6 days), apoptotic cells increase in the epidermis and dermis of MRL-Faslpr mice more robustly than in UVB-irradiated BALB/c mice (Fig. 7⇑B). In contrast, the number of apoptotic cells in UVB-irradiated Csf1op/op;MRL-Faslpr skin did not rise (Fig. 7⇑B). Taken together, this indicates that UVB-triggered CSF-1 expression in the skin is linked to the heightened infiltration by Møs and apoptosis. To further examine the link between UVB, CSF-1 expression and apoptosis, we determined whether keratinocytes and dermal fibroblasts, cell types known to generate CSF-1 (39), are stimulated by UVB. As compared with unstimulated cells, CSF-1 expression was up-regulated in primary keratinocytes and dermal fibroblasts derived from MRL-Faslpr mice following UVB (Fig. 7⇑C). Keratinocytes and dermal fibroblasts derived from Csf1op/op;MRL-Faslpr mice served as negative controls. Moreover, up-regulation of CSF-1 in keratinocytes after UVB was as robust as other well-documented stimulants, IFN-γ and TNF-α-LPS (Ref. 40 and data not shown). We detected similar findings using real-time PCR and in human primary keratinocytes and dermal fibroblasts (data not shown). Because CSF-1 recruits Møs to the skin, we tested the hypothesis that the recruited, activated BMMøs destroy the cellular source of CSF-1 in the epidermis, keratinocytes. For this purpose, we incubated keratinocytes and dermal fibroblasts with supernatant from BMMøs (95% pure F480+CD11b+) after treatment with or without CSF-1. Incubation with IFN-γ-LPS, a conventional and potent Mø stimulant served as a positive control. CSF-1 directly activated BMMøs as determined by up-regulation of CD86 (flow cytometry, data not shown). These activated BMMøs released mediators that induced apoptosis of keratinocytes and dermal fibroblasts (Fig. 7⇑D). In the context of these experiments, it is notable that CSF-1-stimulated BMMø (derived from MRL-Faslpr mice) released mediators that induced apoptosis in a greater number of keratinocytes (PAM 212 line) than unstimulated BMMøs. Importantly, apoptosis is not induced in keratinocytes directly stimulated with CSF-1 alone (Fig. 7⇑D). We detected similar findings when we repeated this experiment using BMMøs derived from B6 mice (data not shown), indicating that the mediators inducing apoptosis were not unique to MRL-Faslpr mice. 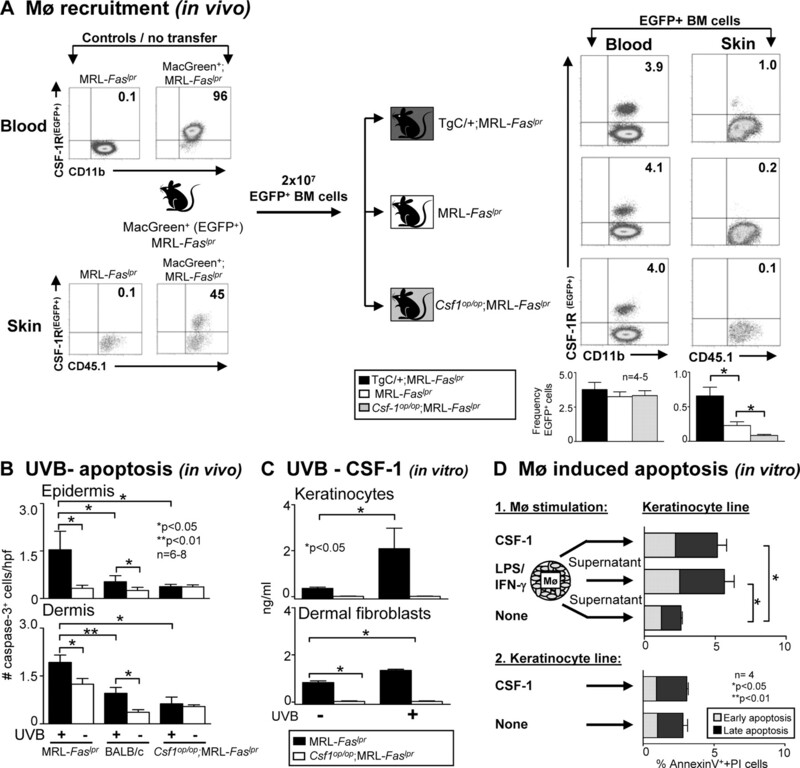 Taken together, in MRL-Faslpr mice, UVB induces CSF-1 expression in keratinocytes. CSF-1 attracts Møs to migrate from the circulation toward intradermal cells generating CSF-1. CSF-1 fosters Mø activation, and these leukocytes release mediators that destroy CSF-1-generating cells (Fig. 8⇓). Thus, in lupus-susceptible, but not lupus-resistant, mice, UVB exposure induces CSF-1 that, in turn, activates a CSF-1-dependent pathway leading to CLE. Scheme of UVB-triggered CSF-1- and Mø-mediated apoptosis during cutaneous lupus in MRL-Faslpr mice. Box 1, UVB induces CSF-1 expression in keratinocytes. Box 2, BMMøs are recruited by CSF-1 to sites rich in CSF-1 in the skin (e.g., keratinocytes). CSF-1 activates Møs that release mediators (Box 3) and induce apoptosis of adjacent cells (Box 4; e.g., keratinocytes). The pathologies of cutaneous lesions in MRL-Faslpr mice and human CLE are similar (41). Sunlight (UVB exposure) triggers the expression of human CLE and human lupus (1). Because CSF-1 is required for nephritis in MRL-Faslpr mice, we analyzed the impact of CSF-1 in the pathogenesis of CLE in MRL-Faslpr mice (23). By constructing unique mutant MRL-Faslpr strains expressing varying levels of CSF-1 (high, intermediate, none), and using an ex vivo gene transfer system to increase intradermal CSF-1, we determined that CSF-1 is necessary for and incites CLE in MRL-Faslpr mice. Hypothesizing that UVB exposure worsens CLE through a CSF-1-dependent mechanism, we showed that UVB exposure increased Møs and apoptosis in the skin and incited CLE in MRL-Faslpr, but not in CSF-1-deficient MRL-Faslpr mice. Probing deeper, we determined a CSF-1-dependent, Mø-mediated mechanism is responsible for CLE. Lupus susceptibility genes are essential for CSF-1-mediated CLE. Using either CSF-1 carrier cells or UVB-exposure, CLE was induced in the lupus-susceptible MRL-Faslpr mice, but not in the lupus-resistant BALB/c mice. This finding is consistent with sunlight (UVB) triggering CLE in lupus patients, but not in normal individuals (42). Moreover, UVB exposure incited a far greater accumulation of Møs within the skin of MRL-Faslpr as compared with lupus-resistant BALB/c mice, despite inducing similar levels of CSF-1 in the skin. This finding is consistent with hyperproliferation of Møs to CSF-1 in MRL-Faslpr, but not in nonautoimmune strains (43). Thus, Mø responsiveness to CSF-1 may be a critical feature of lupus susceptibility leading to CLE. Our findings highlight a central role for Møs in CLE. These are consistent with the essential contribution of Møs to psoriasis (an inflammatory skin condition traditionally thought to be triggered by T lymphocytes) in two distinct models, T cell dependent and T cell independent (14, 15). In this autoimmune skin disorder, the recruitment and activation of Møs in the psoriatic skin is a key pathogenic event in the development and maintenance of psoriatic lesions. Thus, it is tempting to suggest that the underlying events that lead to Mø recruitment, activation, and the misbehavior of these Møs in psoriasis are linked to CSF-1. We are aware that Møs are somewhat less prevalent in human CLE than in the MRL-Faslpr mice. We view the greater number of Møs in MRL-Faslpr CLE as an advantage to more clearly dissect the role of these CSF-1R-bearing leukocytes in the disease process. Our findings indicate that a rise in CSF-1 alone is not sufficient for CLE but rather require the MRL-Faslpr background genes. Although our data suggest that Møs are central to UVB incited CLE, the increase in Møs is followed by a substantial rise in CD4 T cells. Thus, distinct populations of T cell may regulate CLE. In this regard, gross skin lesions are suppressed in MRL-Faslpr mice lacking CD4, but not CD8 T cells (44). Alternatively, expanding NK T cells by provision of α-galactosylceramide (45) suppresses dermatitis, and eliminating CD1d, an Ag-presenting molecule know to activate NK T cells, exacerbates dermitis (46). In contrast, CLE is accelerated in β2-microglobulin-deficient MRL-Faslpr mice in which normal development of CD1-dependent NK T cells is prevented (47). Thus, it is not clear whether NK T cells are central to CLE. With this in mind, we plan to pinpoint the distinct T cell populations in lupus-susceptible MRL-Faslpr mice, but not lupus-resistant strains required for UVB-incited CLE. We report the novel finding that UVB induces CSF-1 in keratinocytes and dermal fibroblasts. We detected a rise in CSF-1 mRNA (real-time PCR) and/or protein (ELISA) following UVB exposure in mouse keratinocytes (primary cells and PAM 212 line), primary human keratinocytes, primary mouse dermal fibroblasts, and human dermal fibroblasts. In contrast, another report, using Northern analysis and proliferation assays, indicated that UVB decreases CSF-1 expression by PAM 212 mouse keratinocytes and fibroblasts of a mouse dermal line (39). The discrepancy between these findings and ours might be related to the differences between primary cells and cell lines and/or the assay techniques used. We are confident of our findings given that our in vitro studies are consistent with our and others’ in vivo evidence that UVB increases intradermal CSF-1 (48), and the reproducibility of our findings in two primary cell types, keratinocytes and dermal fibroblasts, derived from two species, mice and humans. UVB exposure induces apoptosis in the skin, and apoptotic cells have been implicated in the pathogenesis of lupus (49, 50, 51). There are several mechanisms that may be instrumental in inducing apoptosis in skin parenchymal cells. For example, UVB induces direct, ligand-independent activation of membrane death receptors such as Fas-Fas ligand up-regulation (52). However, because MRL-Faslpr mice lack a functional Fas Ag, we can dismiss this mechanism. The release of TNF-α and subsequent ligation of the TNFR (p55) mediates keratinocyte apoptosis (53, 54). In this regard, TNF-α, along with NO and reactive oxygen species, are mediators released by activated Mø that induce apoptosis of renal parenchymal cells, TECs (16, 23). In the present study, the UVB induction of CSF-1 in the skin (keratinocytes and dermal fibroblasts) recruits and activates Møs. These Møs home to sites rich in CSF-1 and release mediators that induce apoptosis in adjacent cells. This suggests that the CSF-1-dependent influx of Møs is the culprit responsible for UVB-incited apoptosis in the skin. This is consistent with the enhanced numbers of intradermal apoptotic cells and Møs after UVB exposure in MRL-Faslpr, as compared with BALB/c and CSF-1-deficient MRL-Faslpr mice. MRL-Faslpr mice are defective in phagocytosis of apoptotic cells, and this inefficient clearance, which is also discussed in human lupus (55), might contribute in part to the accumulation of intradermal apoptotic cells (56, 57). Finally, evidence indicates that apoptotic cells could be instrumental in inducing autoantibodies that promote systemic lupus (3, 58) Thus, it is intriguing to speculate that UVB induction of CSF-1 in the skin may initiate systemic lupus by increasing apoptotic cells in the skin, and/or causing a rise in systemic CSF-1 and/or boosting the activated Møs in the skin that may egress and home to other tissues. Future experiments will test these possibilities. In conclusion, our studies identify a UVB-incited, CSF-1-dependent, Mø-mediated sequence leading to CLE in lupus-susceptible strains. We envision CSF-1 as the match and lupus susceptibility genes as the tinder required for CLE. We thank Dr. A. Schwarting and M. Blanfeld for running the SSA-SSB ELISA and Dr. Terry B. Strom for editorial suggestions. ↵1 This work was supported by a grant from the Lupus Research Institute (to V.R.K. ), Deutsche Forschungsgemeinschaft Grant ME-3194/1-1 (to J.M. ), and Ruth L. Kirschstein National Research Service Award F32 DK078416-01 (to J.L.). ↵3 Abbreviations used in this paper: CLE, cutaneous lupus erythematosus; MRL-++, MRL/MpJ-+/+; MRL-Faslpr, MRL/MpJ-Faslpr/Faslpr; Mø, macrophage; BM, bone marrow; BMMø, BM-derived Mø; DC, dendritic cell; TEC, tubular epithelial cell; EGFP, enhanced GFP; PI, propidium iodide. Lin, J. H., J. P. Dutz, R. D. Sontheimer, V. P. Werth. 2007. Pathophysiology of cutaneous lupus erythematosus. Clin. Rev. Allergy Immunol. 33: 85-106. Furukawa, F., T. Yoshimasu. 2005. Animal models of spontaneous and drug-induced cutaneous lupus erythematosus. Autoimmun. Rev. 4: 345-350. Werth, V. P.. 2007. Cutaneous lupus: insights into pathogenesis and disease classification. Bull. NYU Hosp. Jt. Dis. 65: 200-204. Synkowski, D. R., T. T. Provost. 1983. Characterization of the inflammatory infiltrate in lupus erythematosus lesions using monoclonal antibodies. J. Rheumatol. 10: 920-924. Kanauchi, H., F. Furukawa, S. Imamura. 1991. Characterization of cutaneous infiltrates in MRL/lpr mice monitored from onset to the full development of lupus erythematosus-like skin lesions. J. Invest. Dermatol. 96: 478-483. David-Bajar, K. M., B. M. Davis. 1997. Pathology, immunopathology, and immunohistochemistry in cutaneous lupus erythematosus. Lupus 6: 145-157. Furukawa, F., H. Kanauchi, H. Wakita, Y. Tokura, T. Tachibana, Y. Horiguchi, S. Imamura, S. Ozaki, M. Takigawa. 1996. Spontaneous autoimmune skin lesions of MRL/n mice: autoimmune disease-prone genetic background in relation to Fas-defect MRL/1pr mice. J. Invest. Dermatol. 107: 95-100. Alaibac, M., E. Berti, C. Chizzolini, S. Fineschi, A. V. Marzano, B. Pigozzi, E. Riboldi, S. Sozzani, A. Kuhn. 2006. Role of cellular immunity in the pathogenesis of autoimmune skin diseases. Clin. Exp. Rheumatol. 24: S14-S19. Clark, R. A., T. S. Kupper. 2006. Misbehaving macrophages in the pathogenesis of psoriasis. J. Clin. Invest. 116: 2084-2087. Clark, R., T. Kupper. 2005. Old meets new: the interaction between innate and adaptive immunity. J. Invest. Dermatol. 125: 629-637. Dupasquier, M., P. Stoitzner, A. van Oudenaren, N. Romani, P. J. Leenen. 2004. Macrophages and dendritic cells constitute a major subpopulation of cells in the mouse dermis. J. Invest. Dermatol. 123: 876-879. Kelly, M., J. M. Hwang, P. Kubes. 2007. Modulating leukocyte recruitment in inflammation. J. Allergy Clin. Immunol. 120: 3-10. Kiekens, R. C., T. Thepen, A. J. Oosting, I. C. Bihari, J. G. Van De Winkel, C. A. Bruijnzeel-Koomen, E. F. Knol. 2001. Heterogeneity within tissue-specific macrophage and dendritic cell populations during cutaneous inflammation in atopic dermatitis. Br. J. Dermatol. 145: 957-965. Wang, H., T. Peters, D. Kess, A. Sindrilaru, T. Oreshkova, N. Van Rooijen, A. Stratis, A. C. Renkl, C. Sunderkotter, M. Wlaschek, et al 2006. Activated macrophages are essential in a murine model for T cell-mediated chronic psoriasiform skin inflammation. J. Clin. Invest. 116: 2105-2114. Stratis, A., M. Pasparakis, R. A. Rupec, D. Markur, K. Hartmann, K. Scharffetter-Kochanek, T. Peters, N. van Rooijen, T. Krieg, I. Haase. 2006. Pathogenic role for skin macrophages in a mouse model of keratinocyte-induced psoriasis-like skin inflammation. J. Clin. Invest. 116: 2094-2104. Tesch, G. H., A. Schwarting, K. Kinoshita, H. Y. Lan, B. J. Rollins, V. R. Kelley. 1999. Monocyte chemoattractant protein-1 promotes macrophage-mediated tubular injury, but not glomerular injury, in nephrotoxic serum nephritis. J. Clin. Invest. 103: 73-80. Cecchini, M. G., M. G. Dominguez, S. Mocci, A. Wetterwald, R. Felix, H. Fleisch, O. Chisholm, W. Hofstetter, J. W. Pollard, E. R. Stanley. 1994. Role of colony stimulating factor-1 in the establishment and regulation of tissue macrophages during postnatal development of the mouse. Development 120: 1357-1372. Pixley, F. J., E. R. Stanley. 2004. CSF-1 regulation of the wandering macrophage: complexity in action. Trends Cell Biol. 14: 628-638. Ginhoux, F., F. Tacke, V. Angeli, M. Bogunovic, M. Loubeau, X. M. Dai, E. R. Stanley, G. J. Randolph, M. Merad. 2006. Langerhans cells arise from monocytes in vivo. Nat. Immunol. 7: 265-273. Lenda, D. M., E. R. Stanley, V. R. Kelley. 2004. Negative role of colony-stimulating factor-1 in macrophage, T cell, and B cell mediated autoimmune disease in MRL-Faslpr mice. J. Immunol. 173: 4744-4754. Lenda, D. M., E. Kikawada, E. R. Stanley, V. R. Kelley. 2003. Reduced macrophage recruitment, proliferation, and activation in colony-stimulating factor-1-deficient mice results in decreased tubular apoptosis during renal inflammation. J. Immunol. 170: 3254-3262. Sasmono, R. T., D. Oceandy, J. W. Pollard, W. Tong, P. Pavli, B. J. Wainwright, M. C. Ostrowski, S. R. Himes, D. A. Hume. 2003. A macrophage colony-stimulating factor receptor-green fluorescent protein transgene is expressed throughout the mononuclear phagocyte system of the mouse. Blood 101: 1155-1163. Ryan, G. R., X. M. Dai, M. G. Dominguez, W. Tong, F. Chuan, O. Chisholm, R. G. Russell, J. W. Pollard, E. R. Stanley. 2001. Rescue of the colony-stimulating factor 1 (CSF-1)-nullizygous mouse (Csf1op/Csf1op phenotype with a CSF-1 transgene and identification of sites of local CSF-1 synthesis. Blood 98: 74-84. Faust, J., J. Menke, J. Kriegsmann, V. R. Kelley, W. J. Mayet, P. R. Galle, A. Schwarting. 2002. Correlation of renal tubular epithelial cell-derived interleukin-18 up- regulation with disease activity in MRL-Faslpr mice with autoimmune lupus nephritis. Arthritis Rheum. 46: 3083-3095. Moore, K. J., K. Yeh, T. Naito, V. R. Kelley. 1996. TNF-α enhances colony-stimulating factor-1-induced macrophage accumulation in autoimmune renal disease. J. Immunol. 157: 427-432. Mee, J. B., C. Antonopoulos, S. Poole, T. S. Kupper, R. W. Groves. 2005. Counter-regulation of interleukin-1α (IL-1α) and IL-1 receptor antagonist in murine keratinocytes. J. Invest. Dermatol. 124: 1267-1274. Dlugosz, A. A., A. B. Glick, T. Tennenbaum, W. C. Weinberg, S. H. Yuspa. 1995. Isolation and utilization of epidermal keratinocytes for oncogene research. Methods Enzymol. 254: 3-20. Rogers, K. M., D. H. Black, R. Eberle. 2007. Primary mouse dermal fibroblast cell cultures as an in vitro model system for the differential pathogenicity of cross-species Herpesvirus papio 2 infections. Arch. Virol. 152: 543-552. Wuthrich, R. P., L. H. Glimcher, M. A. Yui, A. M. Jevnikar, S. E. Dumas, V. E. Kelley. 1990. MHC class II, antigen presentation and tumor necrosis factor in renal tubular epithelial cells. Kidney Int. 37: 783-792. Danos, O., R. C. Mulligan. 1988. Safe and efficient generation of recombinant retroviruses with amphotropic and ecotropic host ranges. Proc. Natl. Acad. Sci. USA 85: 6460-6464. Merad, M., M. G. Manz, H. Karsunky, A. Wagers, W. Peters, I. Charo, I. L. Weissman, J. G. Cyster, E. G. Engleman. 2002. Langerhans cells renew in the skin throughout life under steady-state conditions. Nat. Immunol. 3: 1135-1141. Vermes, I., C. Haanen, H. Steffens-Nakken, C. Reutelingsperger. 1995. A novel assay for apoptosis: flow cytometric detection of phosphatidylserine expression on early apoptotic cells using fluorescein labelled annexin V. J. Immunol. Methods 184: 39-51. Blaszczyk, M., S. Jablonska, T. P. Chorzelski, M. Jarzabek-Chorzelska, E. H. Beutner, V. Kumar. 1992. Clinical relevance of immunologic findings in cutaneous lupus erythematosus. Clin. Dermatol. 10: 399-406. Theofilopoulos, A. N., F. J. Dixon. 1985. Murine models of systemic lupus erythematosus. Adv. Immunol. 37: 269-390. Schuhmachers, G., K. Ariizumi, T. Kitajima, D. Edelbaum, S. Xu, R. K. Shadduck, G. L. Gilmore, R. S. Taylor, P. R. Bergstresser, A. Takashima. 1996. UVB radiation interrupts cytokine-mediated support of an epidermal-derived dendritic cell line (XS52) by a dual mechanism. J. Invest. Dermatol. 106: 1023-1029. Chodakewitz, J. A., J. Lacy, S. E. Edwards, N. Birchall, D. L. Coleman. 1990. Macrophage colony-stimulating factor production by murine and human keratinocytes: enhancement by bacterial lipopolysaccharide. J. Immunol. 144: 2190-2196. Furukawa, F., H. Tanaka, K. Sekita, T. Nakamura, Y. Horiguchi, Y. Hamashima. 1984. 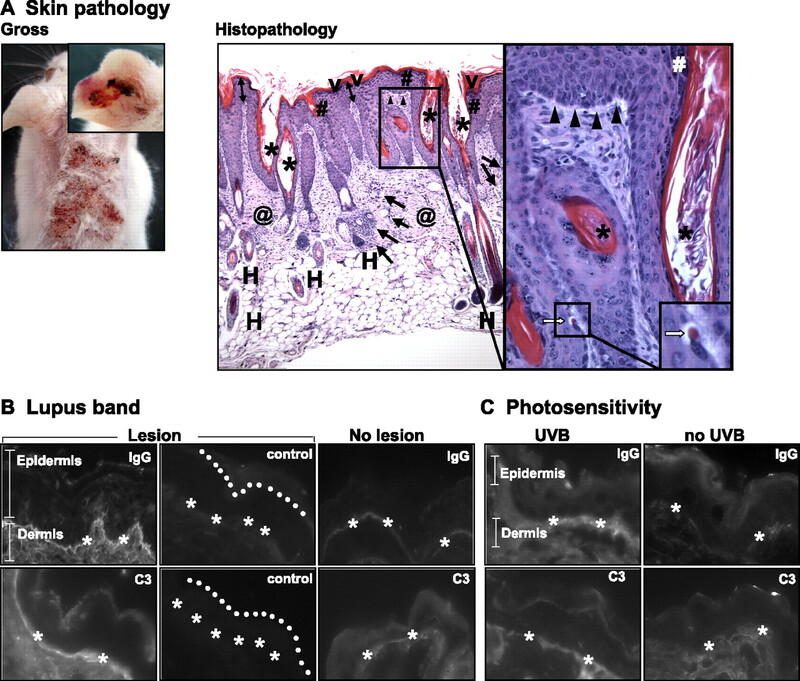 Dermatopathological studies on skin lesions of MRL mice. Arch. Dermatol. Res. 276: 186-194. Hasan, T., F. Nyberg, E. Stephansson, P. Puska, M. Hakkinen, S. Sarna, A. M. Ros, A. Ranki. 1997. Photosensitivity in lupus erythematosus, UV photoprovocation results compared with history of photosensitivity and clinical findings. Br. J. Dermatol. 136: 699-705. Moore, K. J., T. Naito, C. Martin, V. R. Kelley. 1996. Enhanced response of macrophages to CSF-1 in autoimmune mice: a gene transfer strategy. J. Immunol. 157: 433-440. Koh, D. R., A. Ho, A. Rahemtulla, W. P. Fung-Leung, H. Griesser, T. W. Mak. 1995. Murine lupus in MRL/lpr mice lacking CD4 or CD8 T cells. Eur. J. Immunol. 25: 2558-2562. Yang, J.-Q., V. Saxena, H. Xu, L. Van Kaer, C.-R. Wang, R. R. Singh. 2003. Repeated α-galactosylceramide administration results in expansion of NK T cells and alleviates inflammatory dermatitis in MRL-lpr/lpr mice. J. Immunol. 171: 4439-4446. Yang, J.-Q., T. Chun, H. Liu, S. Hong, H. Bui, L. Van Kaer, C.-R. Wang, R. R. Singh. 2004. CD1d deficiency exacerbates inflammatory dermatitis in MRL-lpr/lpr mice. Eur. J. Immunol. 34: 1723-1732. Chan, O. T. M., V. Paliwal, J. M. McNiff, S.-H. Park, A. Bendelac, M. J. Shlomchik. 2001. Deficiency in β2-microglobulin, but not CD1, accelerates spontaneous lupus skin disease while inhibiting nephritis in MRL-faslpr mice: an example of disease regulation at the organ level. J. Immunol. 167: 2985-2990. Scordi, I. A., V. Vincek. 2000. Timecourse study of UVB-induced cytokine induction in whole mouse skin. Photodermatol. Photoimmunol. Photomed. 16: 67-73. Van Laethem, A., S. Claerhout, M. Garmyn, P. Agostinis. 2005. The sunburn cell: regulation of death and survival of the keratinocyte. Int. J. Biochem. Cell Biol. 37: 1547-1553. Bijl, M., E. Reefman, P. C. Limburg, C. G. Kallenberg. 2007. Inflammatory clearance of apoptotic cells after UVB challenge. Autoimmunity 40: 244-248. Takahashi, H., A. Ishida-Yamamoto, H. Iizuka. 2001. Ultraviolet B irradiation induces apoptosis of keratinocytes by direct activation of Fas antigen. J. Invest. Dermatol. Symp. Proc. 6: 64-68. Zhuang, L., B. Wang, D. N. Sauder. 2000. Molecular mechanism of ultraviolet-induced keratinocyte apoptosis. J. Interferon Cytokine Res. 20: 445-454. Zhuang, L., B. Wang, G. A. Shinder, G. M. Shivji, T. W. Mak, D. N. Sauder. 1999. TNF receptor p55 plays a pivotal role in murine keratinocyte apoptosis induced by ultraviolet B irradiation. J. Immunol. 162: 1440-1447. Gaipl, U. S., A. Kuhn, A. Sheriff, L. E. Munoz, S. Franz, R. E. Voll, J. R. Kalden, M. Herrmann. 2006. Clearance of apoptotic cells in human SLE. Curr. Dir. Autoimmun. 9: 173-187. Licht, R., J. W. Dieker, C. W. Jacobs, W. J. Tax, J. H. Berden. 2004. Decreased phagocytosis of apoptotic cells in diseased SLE mice. J. Autoimmun. 22: 139-145. Potter, P. K., J. Cortes-Hernandez, P. Quartier, M. Botto, M. J. Walport. 2003. Lupus-prone mice have an abnormal response to thioglycolate and an impaired clearance of apoptotic cells. J. Immunol. 170: 3223-3232. Gaipl, U. S., L. E. Munoz, G. Grossmayer, K. Lauber, S. Franz, K. Sarter, R. E. Voll, T. Winkler, A. Kuhn, J. Kalden, et al 2007. Clearance deficiency and systemic lupus erythematosus (SLE). J. Autoimmun. 28: 114-121.